As I write this right now, bitcoins are being traded on Mt. Gox, the embattled but most prominent bitcoin exchange, for about $132. 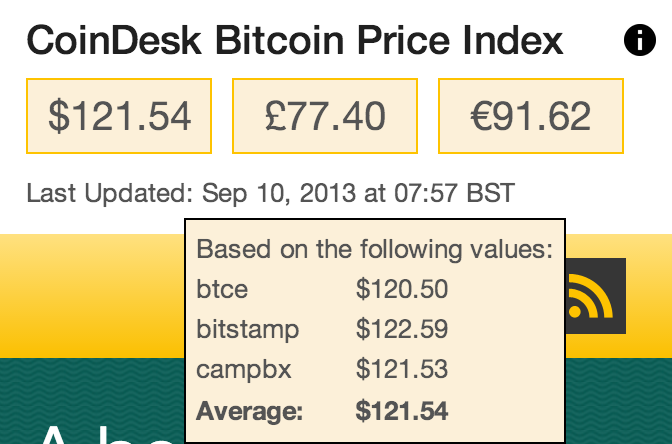 At the same time, over on the Bitstamp exchange, bitcoins are trading for about 10 percent less — at $119 apiece. For those who want to believe that bitcoin has the potential for mainstream adoption, such a value gap is a problem — one that highlights the volatility of the ecosystem. Enter CoinDesk, the London-based bitcoin news site, which is today launching the CoinDesk Bitcoin Price Index, which “aims to establish the price reference for industry participants and accounting professionals,” CoinDesk Contributing Editor Jon Matonis wrote in an email to AllThingsD. There are only three exchanges that currently qualify, according to CoinDesk: Bitstamp, BTC-E and CampBX. The one obvious omission from this list is Mt. Gox, because of complaints of slow withdrawal times recently as the exchange faces increased regulatory and technical hurdles. The hope, Matonis said, is that the CoinDesk Price Index will become the go-to metric to establish exchange rates for bitcoins going forward. Whether such an index helps make a mainstream audience more comfortable with acquiring and transacting in bitcoins remains to be seen. CoinDesk will display its index going back to July 1. For bitcoin price data prior to that date, it will use Mt. Gox’s price.